A self-proclaimed “social ecologist,” Peter Drucker was known to many as the “Father of Modern Management.” What many may not realize is that he was also a one-man consulting firm (who answered his own telephone!) 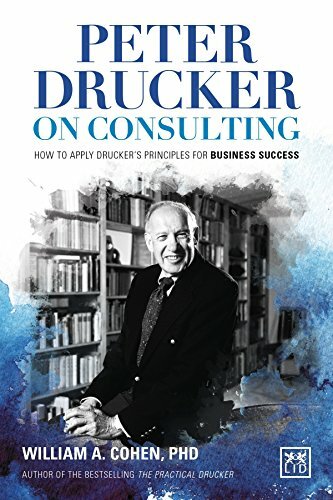 It is this experience that Dr. William Cohen pulls from throughout “Peter Drucker on Consulting.” As a former student and friend of Drucker, Cohen mines that experience here to help others use the lessons he and Drucker learned to become successful consultants. The lessons tend to begin with a quote or story about Drucker, are further extrapolated on through additional stories, and some are finally summarized towards the end of the chapter. Each lesson follows this same basic pattern. Interestingly, like Drucker, Cohen shares many stories (not always cited, like when discussing the Jewish Sanhedrin), but the reader can tell he is very knowledgeable in many areas and has a lot to share. Step 1 - Drucker said something profound. Step 2 - Here’s why. Step 3 - Here’s what happened when other people followed a similar path. Often, though Cohen would not provide specific useful examples as to what the principal could look like today. For example, when determining a problem statement, he suggests that the consultant should “[p]hrase it as a question, beginning with who, what, when, where, how, or why,” but then does not provide any examples of what these may look like. I can develop my own examples, sure. But it would be nice to have a template or great example to compare mine to. I found myself longing for specific examples like these throughout the book. 1. Use what you have. Upbringing or specific opportunities are irrelevant. 2. We can achieve great success in consulting, even without a large business. 3. Integrity is a requirement for long-term success. 4. There will be obstacles. 5. Seek out opportunities for growth and improvement. 7. Learn in lots of different fields. You never know how you might use those disparate ideas you’ve learned. 8. Honor your client’s privacy. 9. Use your client’s expertise to guide them to the answers they need. Cohen concludes the book with a series of essays exploring the impact that Drucker had on the lives of the people and companies he helped. This section really helped to cement the importance of the ideas found in this book. Ultimately, I found myself looking forward to my daily readings from the book, but then found that I needed to set the book down after each chapter to try to absorb what I had learned and apply it to my own professional work. To me, that is the sign of a good idea. With that, while not a perfect book (some parts just seem unnecessary or drag on too long), I recommend “Peter Drucker on Consulting” by William A. Cohen to anyone interested in learning more about effective ways to build an already established business. I must conclude this review the way that Cohen closed his book, by paraphrasing Drucker: “Don’t tell me how much you enjoyed my words—tell me what you are going to do differently on Monday morning” (280).